As a Glove Making Machine Manufacturer, let's talk about the use of the Double Color Film Blowing Machine. 1. Due to possible damage to electrical components or wire heads during transportation, strict inspection should be carried out first. In order to ensure personal safety, the opening mechanism must be connected to the ground wire, then the power supply is turned on, and then the motor operation of each part is strictly checked, and attention is paid. There is no leakage. 2. When installing, pay attention to adjust the center line of the extruder head and the center of the traction roller to be horizontal and vertical, and must not deviate from the skew. 3. When the winding is increased, the outer diameter of the winding is gradually increased. Please pay attention to the matching between the pulling speed and the winding speed. Please adjust it in time. 4. After the host is turned on, pay close attention to the operation of the host, adjust, correct, and adjust the electrical instrument and controller in time to ensure its normal operation. 5. Double Color Film Blowing Machine's main gear box, traction reducer should always refuel, replace the gear oil, please replace the new gear oil with the new machine for about 10 days to ensure the normal operation of the rotating parts, pay attention to refueling, to prevent jamming If it is damaged by overheating, check the tightness of each joint to prevent the bolt from loosening. 6. The compressed air in the bubble tube should be kept in an appropriate amount. Because the compressed air leaks out during the traction process, please replenish it in time. 7. Clean and replace the filter inside the machine head to prevent clogging, and prevent the plastic particles from mixing with iron, sand, stone and other impurities to avoid damage to the screw barrel. 8. 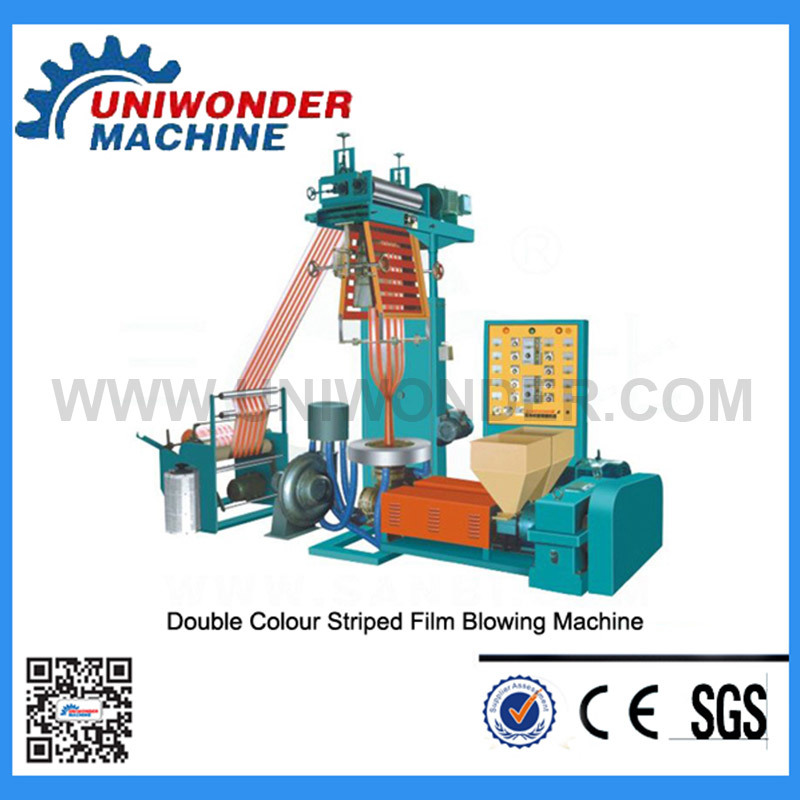 The Double Color Film Blowing Machine is strictly prohibited from turning on the air. When the barrel, tee, and die do not reach the required temperature, the host cannot be started. 9. When starting the main motor, start the motor and accelerate slowly; when the main motor is turned off, it should be decelerated before shutting down. 10. When preheating, the heating should not be too long or too high, so as to avoid blockage of the material.